The Euro became the official currency in Slovenia on 1st January 2007, replacing the Tolar which however remained valid until 15th January 2007. There are some very interesting Commemorative Coins particularly that of 2018 - check it out! Some basic facts relating to Slovenia. 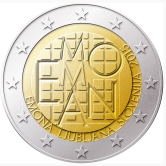 Slovenian Euro Coins have 8 different motifs - 1 for each denomination. 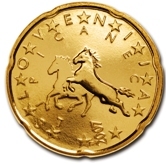 There appears to be no theme grouping of the coins - as for example by Austria or Greece - however I find that Slovenia has minted one of the most attractive and interesting series of Euro coins. 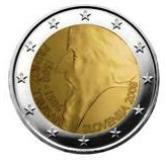 The Commemorative issues are also very attractive, particularly that of 2010 which I think is one of the most beautiful Euro coins yet minted. 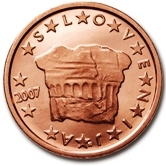 An unusual feature of the Slovenian coins is that the date normally appears at an arbitrary angle to the horizontal plane of the coins. 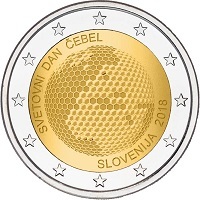 As Slovenia has only been in the Euro zone since 2007 and has such appealing coins, I think it is a wonderful niche area for collectors with limited financial resources. 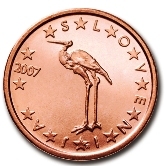 1 cent - A stork, which was the motif of the 20 Stotins (Cent) piece in the previous currency. 5 cent - The painting "Sejalec" by Ivan Grohar - depicted is a sower sowing stars. 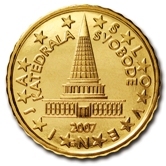 10 cent - A design by Joze Plecnik for the national parliament. 20 cent - A pair of Lipizzaner horses. 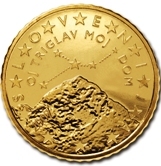 50 cent - Triglav (the highest mountain in Slovenia) plus the constellation of cancer. 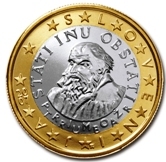 1 Euro - Primas Trubar - a protestant reformer and translator of the New Testament into Slovenian. 2 Euro - France Preseren plus a line from his poem Zdravljica which is the national anthem of Slovenia. 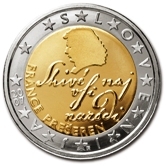 Around the rim of the Two Euro coin the name of the country "Slovenjia" plus a full stop . 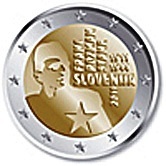 Slovenian Commemorative Two Euro Coins. 2008 - 500th birthday of Primoz Trubar. 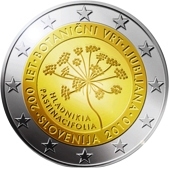 2010 - Commemorates 200 years of the botanical gardens in Lubljana. 2011 - 100th birthday of Franc Rozman - a partisan who fought for the liberation of Slovenia during World War II. 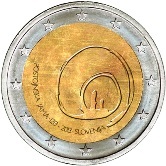 2013 - The 800th Anniversary of the first visit to the Postonja jame (cave) is commemorated with an artisic stylized spiral representing the cave. At the end of the spiral we see two stylized stalagmites. 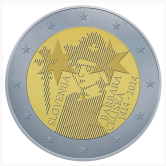 2014 - The 600th Anniversary of the coronation of Barbara of Celje. 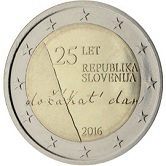 2016 - The 25th Anniversary of the Independence of Slovenia. 2018 - World Bee Day. 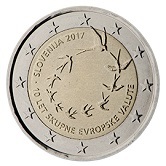 Return from Slovenian Euro Coins to Links to Specific Countries. 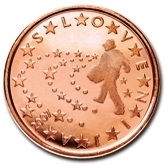 Return from Slovenian Euro Coins to euro coin collector.